The imageCLASS MF7480 model provides Canon's Universal Send capabilities, which allows users to distribute scanned data to multiple destinations, including individuals or groups of e-mail and Internet Fax addresses, Fax destinations, device Mail Boxes, network or host files and folders, and to document management applications. Canon's Universal Send helps customers improve their digital document distribution workflow when sending digital document information to e-mail addresses, network folders, mail boxes and Internet fax destinations. The imageCLASS MF7480 copies and prints at up to 25 pages-per-minute for high-quality letter-size documents. 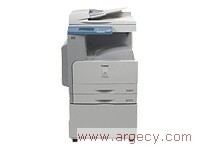 It has full duplexing functionality for copy, print and fax as well as a Automatic Document Feeder (ADF). A large supply of paper can conveniently be utilized from either two 250-sheet front-loading paper cassettes or the 80-sheet multipurpose tray. Canon's Single Cartridge System only requires one consumable to be stocked. This system utilizes one cartridge containing both the toner and drum unit, and is user replaceable. The imageCLASS MF7480 can quickly send and receive faxes using the built-in 33.6 Kbps Super G3 fax modem and incorporates a strong list of fax features, including 200 one-touch speed dial numbers, 300 coded speed dial numbers, 1,000-page fax reception memory capacity, sequential broadcasting and activity reports. Optimized for speed, your projects will be accelerated with a USB 2.0 Hi-Speed interface and ease-of-use is achieved with the 1/4 VGA touch screen panel. The imageCLASS MF7480 incorporates full network connectivity for all MFP functions - print, fax and scan - making the device an ideal solution for multiple personnel offices. It also has the ability to perform scanning over the network with the ability to generate files in JPEG, TIFF and PDF formats. The MF7480 can perform network printing with both PCL5 and PCL6 support. This unit increases productivity and cost-efficiency with the built-in Ethernet port for networking. Share printing and faxing can also be achieved directly from a PC.